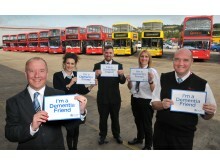 The region's largest bus operator has partnered with the Alzheimer’s Society to help transform the way people think, act and talk about dementia. Through information sessions, delivered to its 1,600-strong team of drivers, Go North East continues its commitment to providing inclusive travel and tourism within the North East. Alzheimer’s Society’s Dementia Friends programme is the biggest ever initiative to change people’s perceptions of dementia. It aims to transform the way the nation thinks, talks and acts about the condition. Well-respected for its industry-leading standards, Go North East encourages its staff to become volunteer Dementia Friends champions, allowing them to deliver information sessions about dementia to drivers across the company’s nine depots. Since the end of October 2016, over 220 drivers have completed the information session. A Dementia Friend learns about what it's like to live with the condition and turns that understanding into action. New drivers will have to become a Dementia Friend before driving in service, and Go North East has pledged that every driver working for the company will become one within the next five years. This is part of a mental health module within Go North East’s Disability Awareness course. Other modules include legislation, company policy, sight guidance (in association with the RNIB), mobility (which covers the company’s easy access guarantee) and hearing loss. The Disability Awareness course forms part of the company’s Driver Certificate of Professional Competence (CPC) training programme. Stephen King, Head of Commercial and Retail said: “We are passionate about never standing still when it comes to achieving excellence in accessibility and this partnership-led initiative with Dementia Friends is incredibly important to us. “There are 30,000 people living with dementia in the North East, so as the region’s largest bus operator we have a responsibility to ensure that our front-line staff understand the condition. 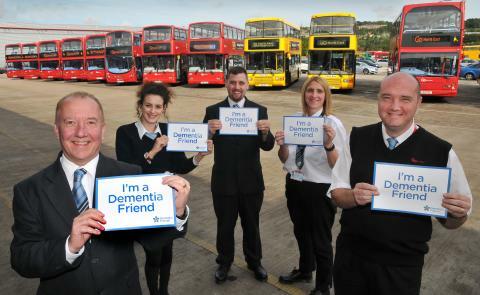 By committing to making all drivers Dementia Friends we aim to provide reassurance to those living with dementia that they can count on a safe and comfortable journey when travelling with us.